We had a very good turnout at the Original Wedding Expo in Sturbridge last weekend! There were lots and lots of couples in attendance and many of them stopped by our booth to check things out! They also stayed awhile to watch our slideshow, check out our sample wedding albums, guest books, proof books and some other fun and unique items that we offer. We love offering unique, hard to find items that we come across and new and interesting ways to show off your images. Whether they are from an engagement session, a wedding, a baby or family portrait or any of the many other types of photography we offer. Thank you to all of you who stopped by to speak with us! We hope you liked what you saw and that you contact us soon, as our schedule fills up very fast, especially after a wedding show. 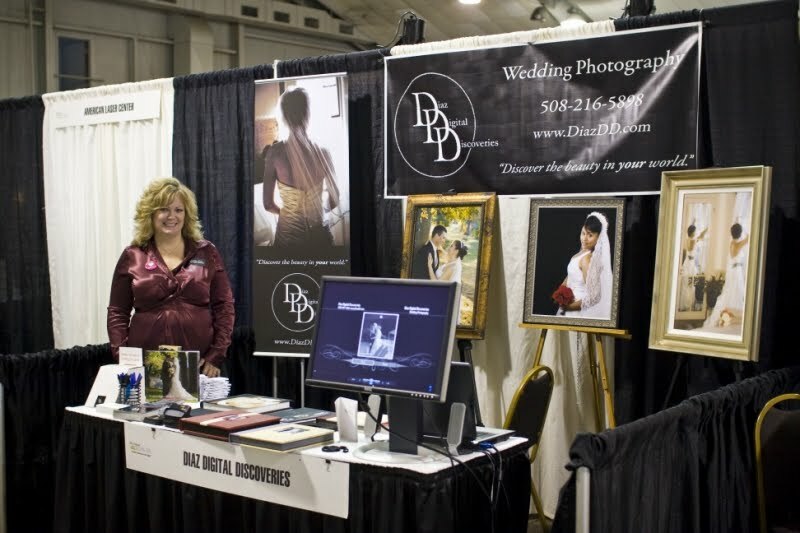 My darling wife Cathy is in the photo here, a snapshot I took of our booth. She is the best! I couldn’t ask for a better partner, in business or in life. We are currently booking for 2010 / 2011 / 2012 weddings. Take advantage of those Expo-Only specials that we had to offer! Remember, all offers expire on November 30th. Reserve your date now, as we do not double-book our days. We look forward to helping make your wedding celebration beautiful, memorable and FUN!